With a unique, streamlined command system, fast-paced battles with alternating activations, customisable armies and simple -- yet deep -- strategic tactics, the game will see you tell the story of the Exodus Wars: a bloody civil war fought between the Guild and the Royal Empire of Man. An engaging and fully realised sci-fi universe set in a period of interstellar civil war -- Play your part in the Exodus Wars. 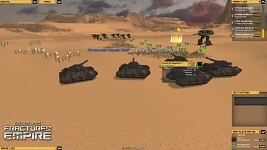 The Royal Empire of Man against the Guild Legions -- Each faction has an extensive roster of units, from infantry and medium armour up to the Empire's Baron small behemoth and the Guild’s Elektra and Enforcer heavy tanks, and with more units being added all the time. Deep strategy via army building -- What you bring to the battle is every bit as important as the tactics you employ. Manoeuvre warfare -- Gameplay that rewards solid tactics. Easy-to-learn, difficult to master -- The intuitive user interface enhances the game's depth and balance. Interleaving activations-based play enables quick play -- Give your formations orders and see these executed on the battlefield; no long waits like you find in typical "You Go, I Go" games. Cover -- Use cover to reduce your opponent's effectiveness. Overwatch -- Achieve superior positioning and control the battlefield. Campaign play -- Play a single-player campaign titled "The Ties That Bind", which can be experienced from either the Guild or Royal Empire of Man perspective for a different view of the story's events. High replayability -- Given the large array of units and the formation combinations possible via the Force Selector interface, not to mention the multiple tactical options available for inflicting your will upon your opponent, every battle offers new challenges and experiences. "It's all the hard-core strategy of a turn based, tabletop, wargame with all the shiny animations but without that sense that a unit is just moving from one square to another ala the Civ games or the long forgotten Warhammer 40,000: Rites of War ... what EW:FE has is potential. Bags of it. Bags and bags." "I love the look and art-design." "the extremely impressive sense of scale...not to mention its marvellously hand-crafted art style"
In its most recent update to the Alpha build of Exodus Wars: Fractured Empire, Membraine Studios added the oft-requested Close Assault to the roster of available orders in its turn-based strategy game, and in doing so has finally delivered on its promise of a game that requires manoeuvre warfare and combined-arms tactics to secure victory. In its now-regular Tuesday Topic post on the FracturedEmpire.net forums, the team outlines its thinking about the just-released Alpha build's implementation of Close Assault and solicits feedback from the community. You can follow this discussions via the link above and you can of course support the team by pre-ordering Exodus Wars: Fractured Empire on Desura, which also enables you to post your opinions and contribute directly to the game's on-going design and development. The Membraine team is also asking Steam-using fans of the turn-based strategy genre to please vote for Exodus Wars: Fractured Empire by visiting the game's Steam Greenlight page. Well i paid for the game i have hit connect and not get any emails. it makes me made when developers makes things harder then they should be. think i forget about this game for a while, at least to they have inplanted a less retarded login in system. I have checked your account and confirmed the Connect did work (your account was set up correctly), so the problem seems to be something more serious. I have emailed you about helping me test your login so we can identify the problem and get you playing the game as soon as possible. Bought the game, but you can't play (even singleplayer) without a fracturedempire account, Desura's Connect button doesn't seem to be working, when I click on it all I get is the message "We sent your details to Exodus Wars: Fractured Empire but received an invalid response, please try again shortly." Is this issue going to be fixed soon? Yeah, I got the email with the account information yesterday, which I think was supposed to be sent out when I first tried to connect last week. 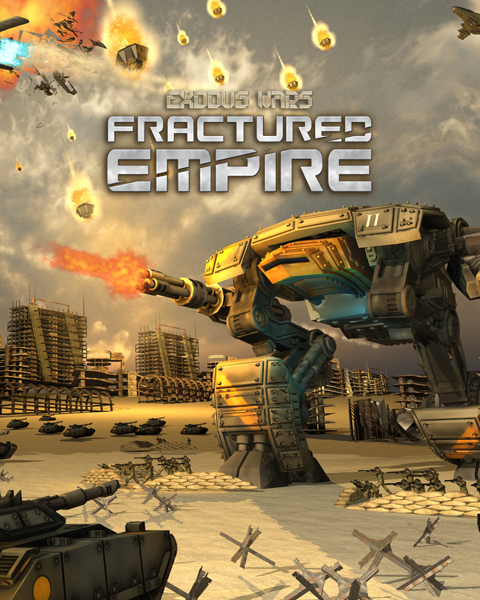 "Thank you for purchasing Exodus Wars: Fractured Empire through Desura. Your account has been created successfully. Your details are below:" etc. Anyway, I have the account and I can play the game now. Thanks for the help! I've experienced a particular error twice. If you select a unit, move it, but attempt to end the move without firing on a target, a message pops up asking if you are sure you want to commit without firing. Problem being, the game seems to freeze at that point, and won't respond to any mouse or keyboard input. This is on Kubuntu 12.10 32 bit. Sorry to hear about that issue. Is it still present in the new v000040 build (the one that introduced Close Assault)? If so, have you flagged it on our development forums (on FracturedEmpire.net/forums)? If not, let me know and I'll enter the issue on your behalf. Launching the game, it downloads the 40 build, but then fails to install it. Thanks for trying to check. I've forwarded the details you've given me for both those issues to our lead developer. To confirm, you had build v000039 before attempting to auto-patch, yeah? (If not, you'll need to download a full install from FracturedEmpire.net/download before the auto-patcher will work correctly -- there was an issue with the earlier build that broke it, but if you already have build 39, this is a different issue). I'll check it tonight and see if it still is there.